Are Samsung Espresso tablets coming May 3rd? In an earlier report we had mentioned that Samsung has been working on a new line of tablets code named as the Espresso, which is expected to be more integrated into the Samsung TV. 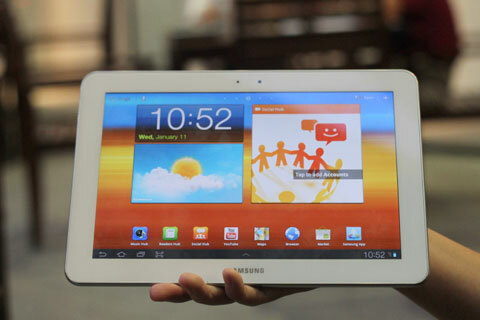 Now it seems like the rumors are turning to be true as according to some sources of CNET, Samsung will be showing off a new tablet which is neither the Galaxy Tab 2 nor the Note 10.1. So we may fit this tablet to the Espresso line. They have also added that the 10.1inch tablet will be equipped with a dual core processor. There are no further details about the tablet so far the new tablet may get announced at an event in London in a few weeks’ time. So without making any more speculations we should wait a little bit more and to get any further details of the tablet. > Notebook / Laptop Reviews and News > News > News Archive > Newsarchive 2012 04 > Are Samsung Espresso tablets coming May 3rd?